This Demonstration illustrates the effects of various input parameters on parallel-flow and counter-flow heat exchangers. 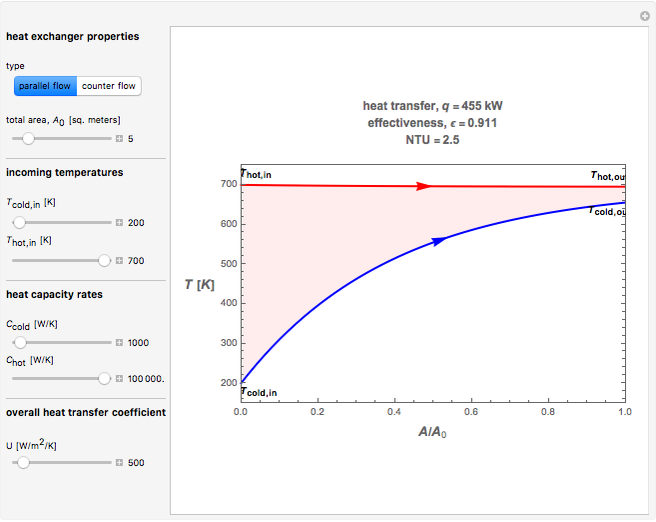 It shows the temperature distribution and calculates the total heat transfer , the effectiveness , where , and the number of transfer units , for both cases. 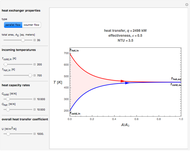 By varying the input parameters, this tool lets you compare and understand the effects in these types of heat exchangers. Snapshot 2: This has the same input as in snapshot 1, but for a counter-flow heat exchanger. The effectiveness and heat transfer are larger than the corresponding parallel-flow case, while the is the same. It is also important to recognize that same heat capacity rates for the counter-flow effect a constant through the whole heat exchanger. 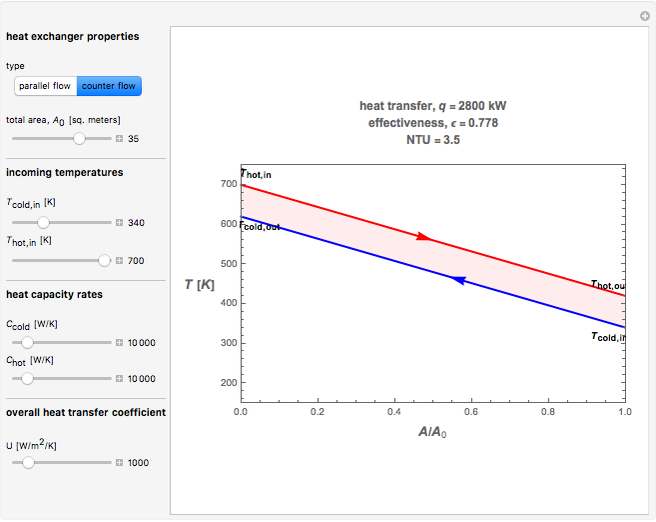 Snapshot 3: This snapshot shows the temperature distribution in a parallel-flow heat exchanger in which . In this case the temperature of the hot flow is nearly constant through the heat exchanger. Snapshot 4: This has the same input as in snapshot 3, this time for the counter-flow heat exchanger. For , the flow direction does not matter. The effectiveness, heat transfer, and are the same in both parallel and counter flow arrangements. 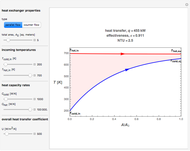 Snapshot 5: Limiting case: The overall heat transfer coefficient . The fluids pass each other without any heat transfer. 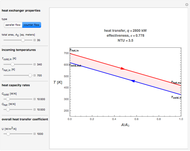 As the chosen snapshots point out, this tool is useful for comparing different cases for parallel- and counter-flow heat exchangers, including limiting cases. 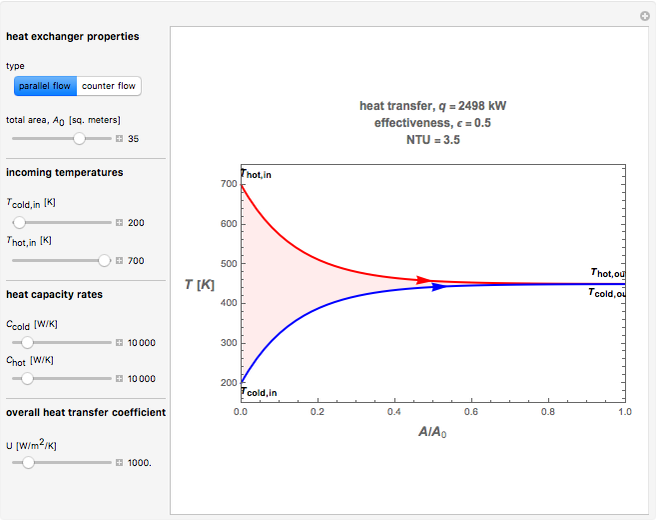 It helps to understand the effects of various input parameters on temperature distributions, effectiveness, heat transfer, and . The temperature distribution is plotted versus the area ratio. The assumption for this model of heat exchangers is a one-dimensional flow for the hot and cold streams. This model can then be used if the fluids exchange heat through a plate or if they exchange heat by flowing through concentric tubes. Maximilian Jüngst and Brian Vick "Operation of Heat Exchangers"